Just received my (free!) 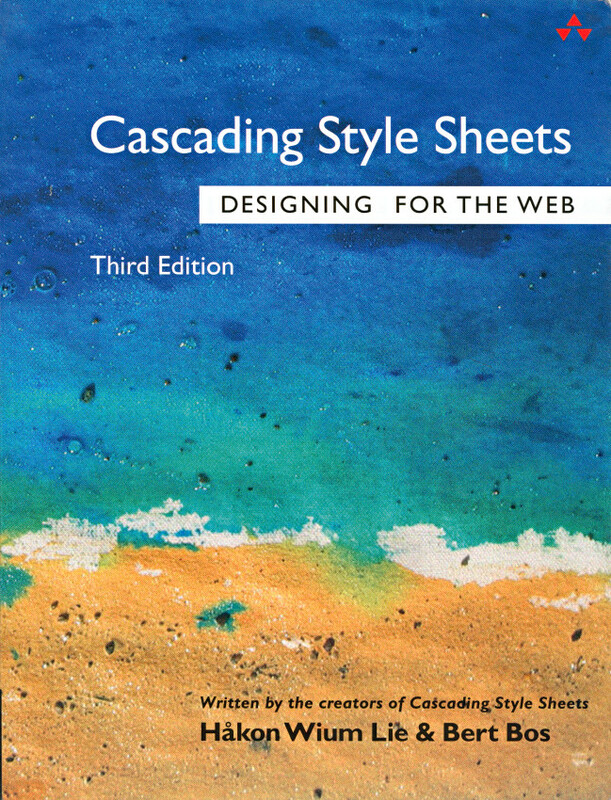 copy of Håkon Lie and Bert Bos’s book on Cascading Style Sheets (Cascading Style Sheets – Designing for the Web, 3rd ed.). Very nice! 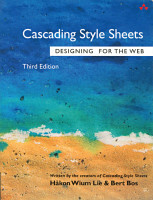 This (the third) edition has been updated to fully cover the details of CSS 2.1. 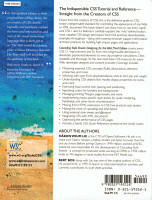 Without having read the book properly yet, it seems to be a very useful and complete guide and reference. 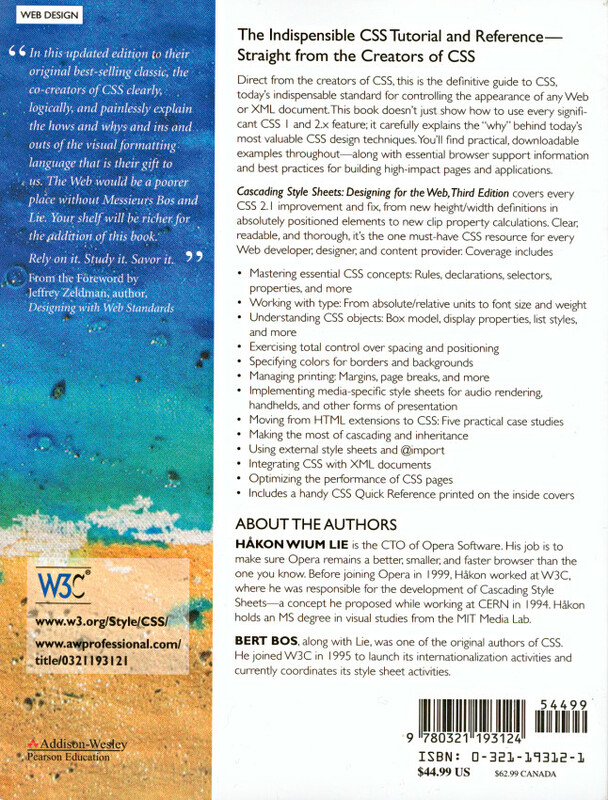 The book is split into logical sections, and for each CSS property discussed there are symbols indicating which browsers support the property in question. What is clear is that video is set to become a greater part of the strategy, with Blake Ross, Firefox’s lead architect, due to start publishing a weekly video diary of his own awareness drive. It’s going to be much more shaky-camera, home-video quality than professional style, said Stanford University student Ross, 19. We’ve got a couple of humorous and edgy ideas planned — one has us making the rounds on the Stanford campus and spreading Firefox in a less-than-traditional way. We want to inspire people to do the kinds of activities we’re going to film. Actually, I want to get into the film industry when I’m done with all this computer stuff, so I’ve done a fair amount of video production and editing over the last couple of years. I’m looking forward to it. It should be hilarious. Cool. I’m looking forward to seeing what comes of this! Is Bill Gates Not Getting It? “I played around with it a bit, but it’s just another browser, and IE [Microsoft’s Internet Explorer] is better,” Mr Gates told me, and challenged my assertion that Firefox’s ‘market share’ is growing rapidly. “So much software gets downloaded all the time, but do people actually use it?” he argued. Just another browser, eh? IE is better is it? How come then that almost ten percent of the Internet’s users already ditched IE, counting only from the beginning of November? When (ex-) IE users realize how easy and efficient web surfing actually can be if you’re only using the right software, in my experience, they seldom look back. Update: It seems the page i linked to at WebSideStory has been removed. Maybe this is because of the imminent update. Update 2: WebSideStory have now released the update, giving Firefox 6.75% of the US usage. Posted in browsers, Internet Explorer, Mozilla Firefox | Comments Off on Is Bill Gates Not Getting It? These. I’d say they are the first high-quality Firefox flash ads I’ve seen so far. Nothing previously has had that professional touch. There was a slight incident across the road from where I live… I’ve put some photos in a documentary section of my web gallery. Posted in Uncategorized | Comments Off on Firebarn?